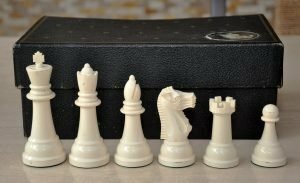 William Pinney Antique Chessmen, Tournament Size. A set of early William Pinney Antique Chessmen, featuring Tournament-size Staunton chessmen, weighted and felted.The Chess set is Black and Natural lacquered Orangewood and is probably composed of pieces from two different sets from the same period. The King stands 3-3/4″ tall with a 1.6″ diameter base. The captivating feature of the William Pinney Antique Chessmen is the unique Knight. Somewhat slab-sided and simple, the Knights have an allure all of their own – to some, it is an acquired taste. 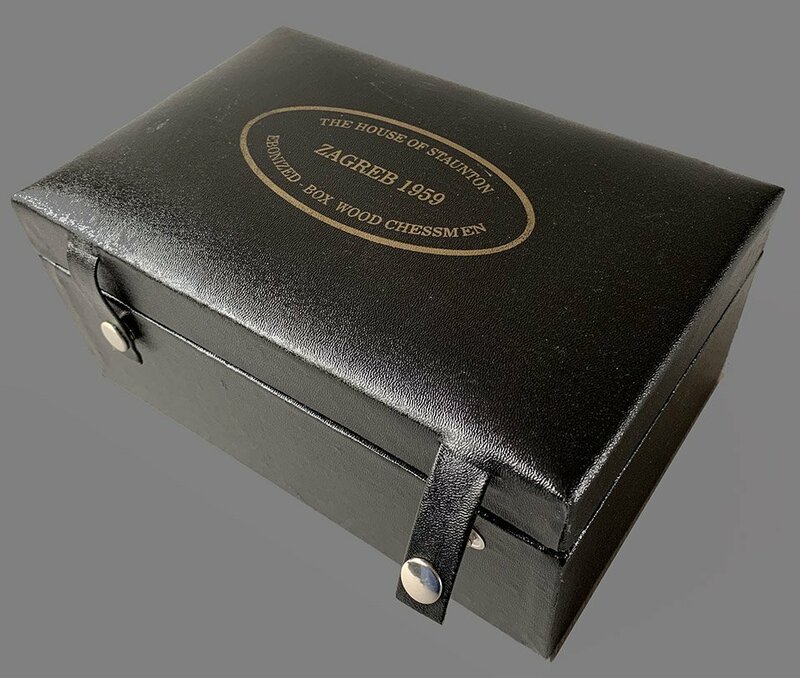 The chessmen are housed in a replacement House of Staunton black leatherette case. 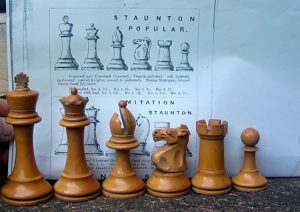 These particular chessmen were produced by Pinney around 1935. The chessmen are in excellent condition, but it appears that the set is composed of pieces from two different sets. Images provided show approximately half the pieces have felt base pads with the initials PM. Also, some of the chessmen appear to have a somewhat darker patina than the others. 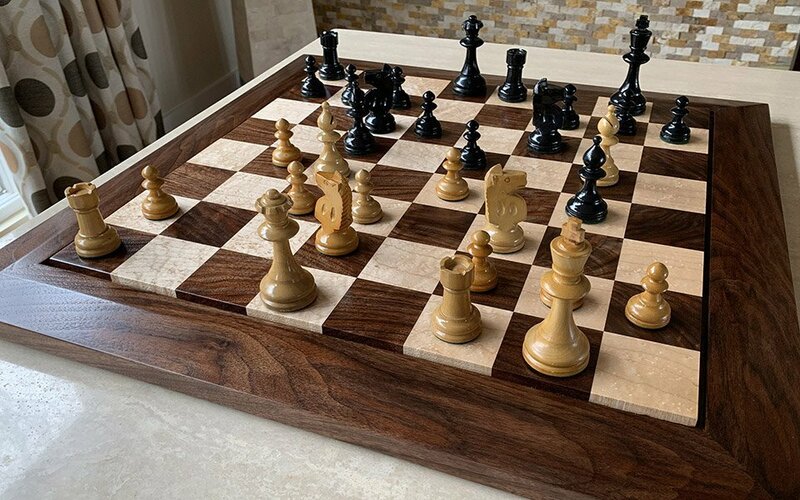 The chessboard shown is not included in this auction, but may be purchased elsewhere on this site. For our extensive collection of antique and modern chessboards, please click here. 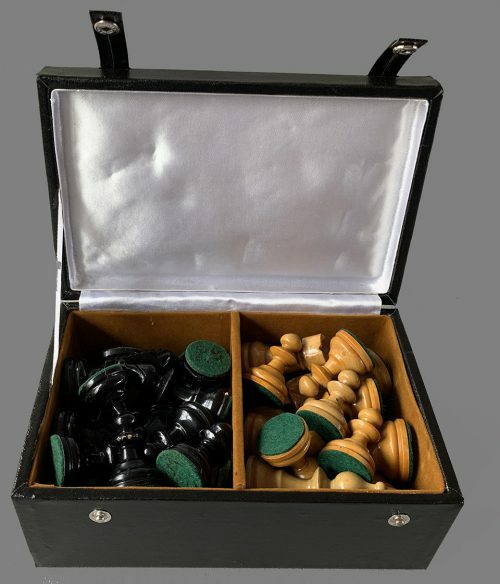 William T. Pinney chessmen were constant fixtures in chess clubs and tournament halls throughout the country from around the 1930s through the late 1950s. The chessmen are often featured on the cover and pages of Chess Review, edited by Al Horowitz, throughout the over three decades of the Magazine’s existence. William T. Pinney was a pattern maker by profession, having worked in the trade for over 18 years. 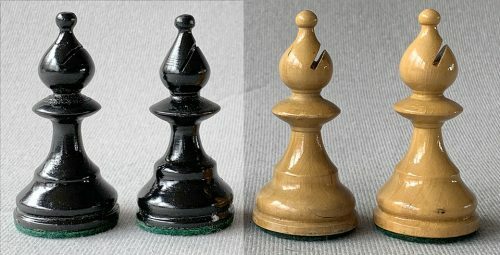 After the closing of the Charleston Navy Yard in South Carolina where he was employed as a pattern maker, Pinney, age 56, turned to the manufacture of wooden chessmen. The making of chessmen in volume had interested him both as a player and a pattern maker. 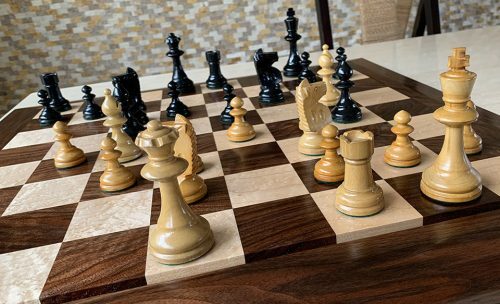 So, in 1933, he set up his shop at 811 Maltmen Avenue, Los Angeles, CA, and started a long and successful career producing wooden chessmen. The machinery used for the mass production was designed and hand-built by Pinney. 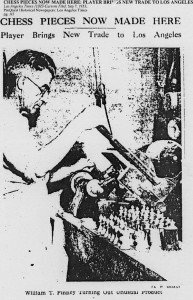 He was among the first U.S. manufacturers to produce chessmen on a mass scale. 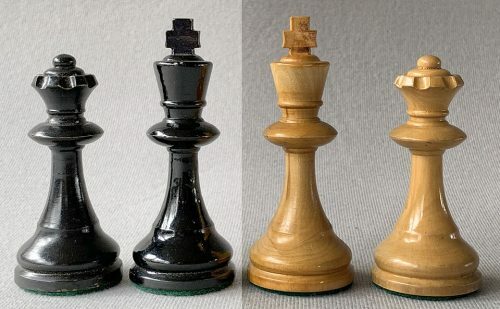 Prior to that, the majority of tournament size chess sets were imported from England, France and Germany.